I collected and made toy soldiers when I was a boy, now many years have passed and in early 1996 my interest was raised again on seeing a newspaper article of "Boys and Their Toys". This listed different hobbies that grown men had taken back up many years after childhood and once again, gained much pleasure from, but this time with the money to support the hobby. I have now been making and painting metal toy soldiers since then and wish to show you some of my "craftsmanship", just go to the pages linked on the left to see examples. I had thought that the eyes were shot and the hands may have the shakes, and that I couldn't do it, but not yet, as you will see. Hope you have a look at all of my work, and give some feedback. Its great to get a message from fellow collectors around the world as there are only a handful of us here in the South West of Australia and its a long way from all the Toy Soldier Fairs in the rest of the world. In April 1998 I was been featured in ' TOY SOLDIER AND MODEL FIGURE' Magazine with an article on this web page. "Probably one of the best sites around with plenty of pictures and links" the Editor, Mark Avery. 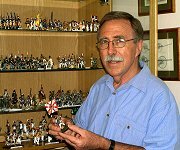 In October 1998 I was awarded the "Big Green Tank Award"
"Since yours is about the best military miniature websites we've seen"
"Australian John O'Brien has been busy painting figures that he displays at his "On-Line Gallery." If you haven't yet checked out his web site, I encourage you to do so as he is "leading the charge" in exhibiting hand painted figures from his personal collection." Britannica.com editors have selected this site as "one of the best on the Internet when reviewed for quality, accuracy of content, presentation and usability."